Astatix Launcher is a program designed for a quick start of applications and documents. Also, Astatix Launcher allows the user to perform some special functions, and also to adjust performing of the special operations by pressing hotkeys. One of additional possibilities is the Winamp control. You can use any hotkeys and control of Winamp anytime even you are playing full-screen games like Quake or Counter Strike. Astatix Launcher consists of two programs: launcher and manager. 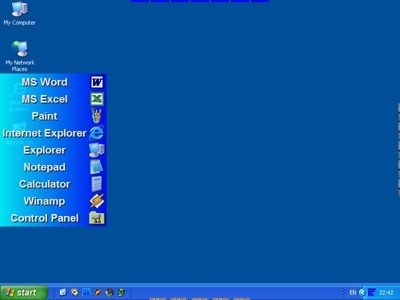 Once started, the launcher puts its icon into system tray. At a click on the icon there is a menu, which you use to control it. Launcher represents applications with rectangular bars with titles and icons of the applications or documents, which are placed on the borders of the screen. They can be located at the top, bottom, left or right edge of the screen, depending on adjustments. On the screen, the ends of bars are visible only. On moving a mouse to them, bars expand from the borders of the screen toward the center. A click on the bar performs the operation associated with this bar. For each bar it is possible to set a shortcut, pressing it will perform the operation appropriate to the given bar. Also there is a possibility to set shortcuts that perform operations without creating a bar.